Overview of NextMinute's GPS tracker when adding time – Welcome to the NextMinute support and feedback centre. This feature allows you to view the location of users on a map. This is useful to prove the location of your staff and also to see where your staff were when selecting on-site, adding timesheet entries, using the timer and changing the job or task status. 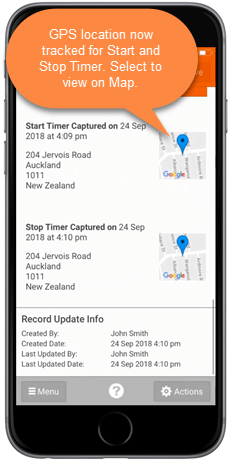 In this article we take you through the steps in using the GPS feature to track location when adding a new timesheet entry and when starting and stopping the timer within a job or task. The new GPS feature allows you to track the location of a user when entering in a new timesheet. In this example we are selecting a Job. In this example, we are entering time through Duration. Your new timesheet entry should now be tracked on a map using the GPS tracking feature. To see the entry on a map select your new timesheet entry from you timesheet list. As you can see below, GPS has tracked the location of the timesheet entry and can be viewed on the Map. The new GPS feature also allows you to track a user when starting and stoping a timer within a Job or Task. In this example we are using the timer within a Task. When at work site select Start Timer and select your labour rate. Your timer should start running now. When finished at your work site and you wish to stop timer select the Timer running section. If you select more in your edit labour section and scroll down you will see that GPS location has now tracked the start and stop for the timer. Select the icon to view location of the start and stop timer on a map. It should be appear like below.